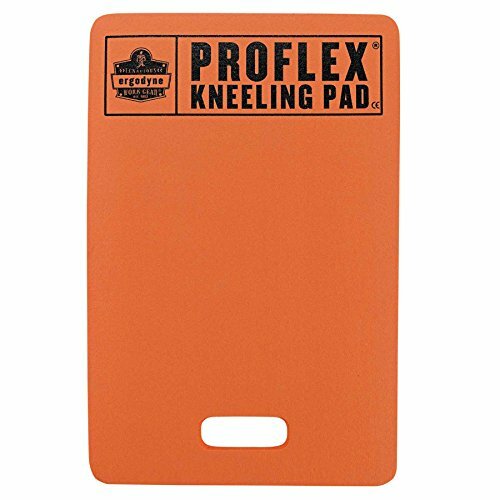 Ergodyne ProFlex 380 standard kneeling pad provides comfort for static kneeling situations. Durable closed-cell foam is non-conductive, resistant to petroleum, and silicone-free. Convenient handle allows for easy transport and also allows for hanging storage. Available in black and orange. DURABLE SUPPORT Made with high density NBR foam rubber that will not compress over time. Silicone-free and non-corrosive to aluminum surfaces. Resistant to petroleum and other liquids making it optimal for car mechanics and garages. LIGHTWEIGHT AND PORTABLE Kneeling pad is lightweight and has a built-in handle making it easy to carry and transport when needed. Convenient handle also allows for hanging storage. MULTIFUNCTIONAL Use to support pressure away from other areas; cushion elbows, shoulders, hips and other body parts when working in tight, constrainted, twisted postures.